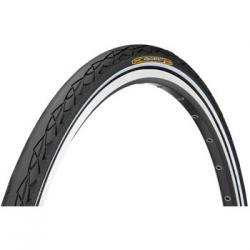 This is a Hybrid tyre for the everyday rider, commuter, tourist, student etc. and comes complete with a 1 year anti puncture guarantee. It includes the new Safety System, where kevlar and polymide fillaments form a protective belt under the tread to further reinforce against intrusion form sharp objects and has 4 piles plus an additional aramid protection belt. Silica/Carbon black compound mix ensures the best grip in both wet and dry conditions and a robust tread layer gives high milage.